As you assemble the cash-flow statement for your business plan, you’ll probably notice that many of the entries are based on numbers from your income statement and your balance sheet. That’s because your company’s cash flow is tied closely to your revenues and costs, as well as to the assets you own and the debts you’ve taken on. But you may discover even more by using a form like the one in the figure to assemble a cash-flow statement from scratch. If you’ve been in business longer than that, you can expand the form to look back even further in time simply by creating additional columns for more years. Your net change in cash position is the difference between the total amount of money your company brought in and the total amount that it expended over the reporting period. To find out the net change in your cash position over a certain period, subtract all the funds that left the company from all the funds that came in to the company. Cash: This entry tracks the total change in your cash reserves over the course of the statement period. Investment portfolio: This entry tracks changes in the value of your investment portfolio over the period. Notice that the cash-flow statement only tracks the flow of cash. It doesn’t reflect changes in the value of other company assets unless those changes delivered cash that was expended or invested. 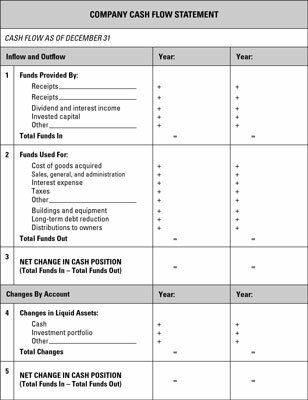 Because the top and the bottom halves of the cash-flow statement must balance, the total changes in liquid assets should be identical to the net change in cash position. In other words, you can determine a net change in cash position by subtracting money going out from money coming in or by monitoring changes to the accounts where the money is coming and going from.